Tibet is a most unusual and beautiful land. The majority of this land rests above 4000 meters (13,000 feet) and is partially surrounded by mountain ranges. The awe-inspiring Himalayas are the highest in the world, as is the never ending Tibetan plateau. Tibet is a place for the rugged adventurer as well as the spiritual wanderer. A land that is held back in time and houses many secrets. Nomads remain much the same as they did one hundred years ago. Then, there are the monasteries which are striving to find a place in a country that's crashing into the twentieth century. The Tibetan people and their religion have been inseparable. Even in their earliest myths one finds references to the Tibetan's religious beliefs. Originally, the Bon religion dominated Tibet. After the introduction of Buddhist statues and later sanskrit documents from India, Buddhism crept increasingly into the Tibetan culture. Tibetan Buddhism is the culmination of some early Bon beliefs, Indian Buddhist texts and several great lamas. Buddhism and politics had been interwoven since King Songsten Gampo married a Chinese and a Nepali princess, who were both intergral in the emergence of Buddhism. 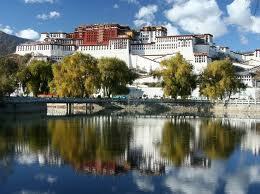 It was the Fifth Dalai Lama who actually built the Potala Palace as the government seat and a religious center. A theocracy had prevailed until 1951. After centuries of virtual isolation Tibet is cautiously opening up to the western world. Officially, China has only opened the doors for travelers these past few years. A visit to Tibet is a marvelous experience, although it is not for the faint-hearted. The traveling is difficult, adventurous, and unpredictable. The infrastructure is poor to non-existent, making a simple road trip a complete adventure. 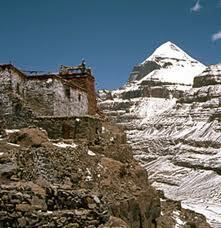 Traveling in Tibet is not a simple trip but an experience of a lifetime which we invite you to take with us. The capital of Tibet, at an altitude of 3650m, is situated on the north of bank of Kyichu River, a tributary of the Yarlung Tsangpo river. Lhasa in Tibetan means " Place of the Gods" and Potala Palace, the Residence of Dalai Lama ( The God King), is the earthly representation of the celestial Palace of Avaloketeswora, The Buddha of infinite compassion whose ncarnation in the human form is believed to be the Dalai Lama. It is a city truly blessed by the gods where life is unburied. Situated about 12 km south of Tsedang, Si the first palace built by the Tibet and for their first recorded king Nyatri Tsedpo, who is believed to have descended from heaven. It is a 05 storied fortress-like dwelling built on the spur of a bill that commands an impressive view of the entire fertile valley. It was destroyed during the cultural revolution and the present structure is an exact replica of the original rebuilt 1982. Lies about 40km to the west of Tsedang across the Tsangpo River. 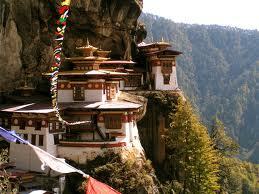 It is the first monastery built by King Trisong Detsen in the latter part of the 08 the century. Samye Monastery combines 03 distinctive architectural styles that of India, China and Tibet, symbolizing the source, stability and spread of the Buddhist faith. With the building of this monastery, the community of monks began. Is a pastoral town between Lhasa and Shigatse. It is 264km South west of Lhasa. It still retains the charm of a traditional Tibetan town untouched by modern expansion. It made world headlines in 1904 when colonel Young Husband, who led a British expedition to Tibet, defeated the Tibetan army there. As a crossroads on the principle trade route to India, it used to be renowned for the excellence of the carpets. The compound, encircled by an impressive wall, once contained 19 monasteries, presided over by the still intact fortress Perched a top a nearby mountain. The town of Shigatse (Xigaze) is called "Center of Rear Tibet", sits at the confluence of Nyangchu and Yarlung Tsangbo Rivers about 250 kilometers to the west of Lhasa. 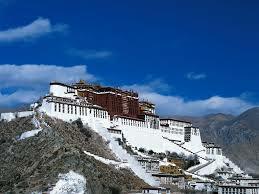 This second largest city in Tibet at an elevation of 3,800 meters has a history of more than five centuries. The region around is historically known as the Rear Tibet and Shigatse has been its political, business, cultural and religious center. The residence for all the Panchen Lamas has been traditionally in the town. The city located between altitude 29°2' north and longitude 88°8' east, with a population of 70,000. The annual rainfall is 300 to 450 mm, the average annual temperature is 6°C and the frost-free period is 160 days. Shigatse region enjoys a moderate climate with plenty of sunshine. The fertile river valley is one of the granaries of Tibet. The town proper has undergone a construction boom with roads leading to Ngari in the west, the Qomolangma Nature Reserve and border with Nepal in the south, Nakchu to the north and Lhasa and Shannan to the east. The ancient town of Shigatse has become well-known for its past and rich cultural tradition with Palcho, Sakya, Pingcuolin and Juenang monasteries and Pala Estate as well as the Qomolangma Nature Reserve covering an area of over 30,000 square kilometers in the nearby region. The annual ceremony of display of Buddha tapestry, the Sorcerer's Dance Festival, the Ximuqingpo Festival at the Shalu Monastery and the active local Tibetan theater are popular attractions to visitors. With its rich cultural tradition, majestic monasteries, breath-taking scenery and convenient location, Shigatse has become on of the most popular tourist destination in Tibet.